A year later, with her Presidency coming to an end, Atkinson is now the longest-serving K-12 Educrat in the nation. Atkinson intends to run for state superintendent again, extending her reign. Lucky North Carolina. Most had suspected that with Common Core bursting into flames that Atkinson would not be entering the race, but yet she has. Glutton for punishment? Control freak? No Golden parachute? Just can’t give up? Who knows. The CCSSO is one of the two D.C. trade groups which hold the copyright on the Common Core. 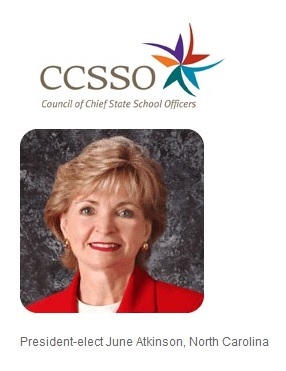 To date, the media in North Carolina has largely ignored Dr. Atkinson’s CCSSO presidency and the clear conflict of interest is poses as the state has entered into a review of the Common Core Standards. Let us remember the millions the CCSSO has been given by the Bill and Melinda Gates Foundation to promote the foundation’s Education Agenda items. The Gates foundation practically bankrolls the CCSSO’s operations. Since 2011, the CCSSO has received grants to push Common Core in the amounts of $4,000,000, $1,958,500, $799,825, $1,100,000, and $9,388,911. In 2009, $3,185,750 was given to the CCSSO by Gates to ‘to partner with federal, state, public, and private interests to develop common, open, longitudinal data standards’. This goes hand in hand with the Statewide Longitudinal Database Systems (SLDS) states were encouraged to develop prior to Common Core. These SLDS’s were required by the Race To The Top grants. The CCSSO received an additional grant for $743,331 to create and prop up the Smarter Balanced Assessment Consortium (SBAC). The SBAC received somewhere around $175 million from the U.S. Department of Education. Lawsuits against the SBAC have cropped up in multiple states, most citing the consortium violates the Compact Clause. NC’s Department of Public Instruction (DPI), under the direction of Dr. Atkinson, would obligate North Carolina to use the SBAC test by entering into the consortium — that is until the legislature figured out what she did and wisely choked off state funding for it. View the NC SBAC Memorandum of Understanding. Note that the May 10, 2014 MOU is signed and dated by Dr. Atkinson and the Chair of the NC Board of Education before the Common Core was released to the public on June 10th, 2010. North Carolina entered the SBAC as a Governing state, but is currently just an affiliate. There are questions surrounding how and why that happened. The SBAC test would have cost North Carolina triple what it was currently spending on assessments. DPI ran an SBAC field test anyway. Where the money came from for that field test is another unanswered question. This entry was posted in Common Core, June Atkinson, LL1885, The Articles and tagged CCSSO, Common Core, SBAC. Bookmark the permalink.